Why not write it... I just haven't gotten to dive enough lately, but I'll be there again next month. I had to decide what to do about pics and decided to go ahead and put some of the old ones in. I hope they are interesting. The area is beautiful. 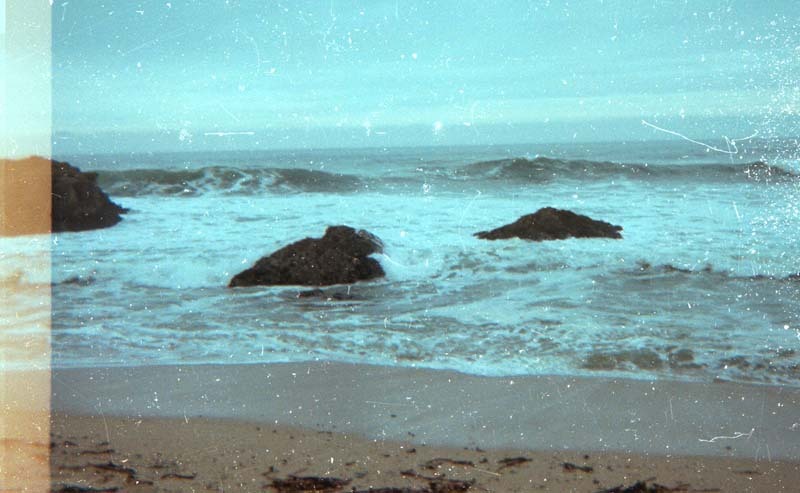 It's really too bad I didn't have a digital camera in the 70's and 80' when I spent so much time bumming along the shore. I saw a lot of neet stuff. The abalone party was this weekend and this was a memorable dive. It's just that there is one thing that I'll have to modify a bit. See if you can find it. 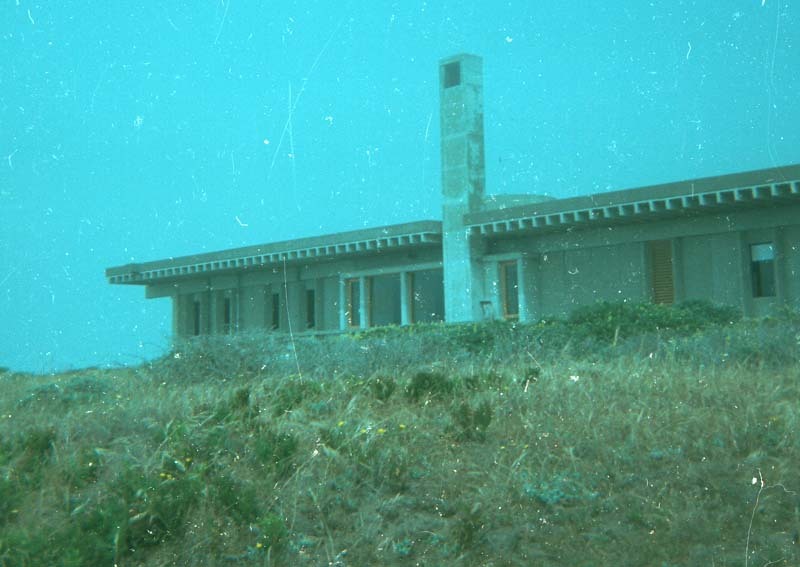 This was one of many dives I made at Bodega Bay in the years after the quarter I spent there at the Marine Lab. I had talked my neighbor into going up to the North Coast to do some abalone hunting . 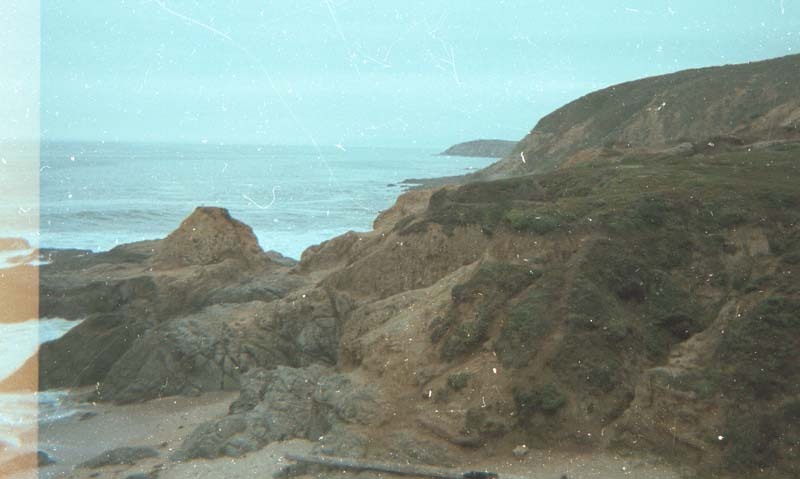 This was when I used to frequently go to Bodega Bay for abalone when I wanted better diving than the nearer Santa Cruz shore offered. 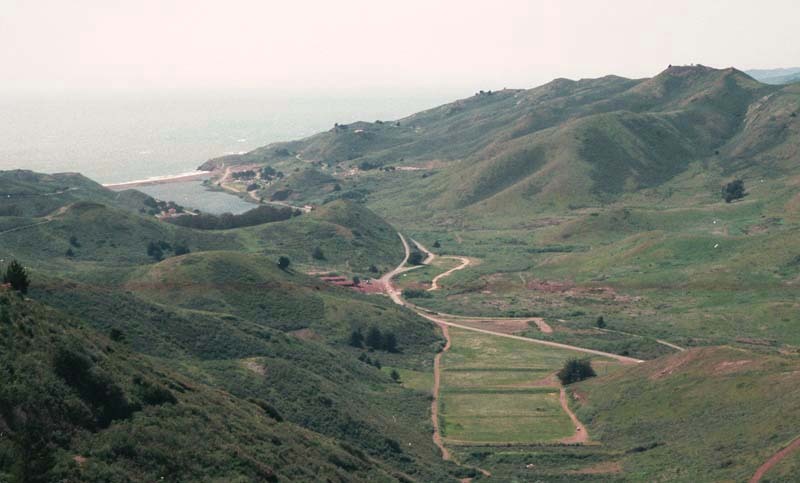 While it is the spot closest to the Bay Area that has easily accessible diving for abalone, not many people go there because it is also the corner of what is cutely called the 'Red Triangle'. The other corners are the Farralon Islands and Pidgeon Point (my other favorite spot). This is the home game turf of the Great White Sharks. It is also not that easy as far as diving so most people head a bit further up the coast to Salt Point and areas around there that are far mellower diving. Anyway, I talked my neighbor, Ron, into going. I figured it was a fair turn around. He had talked me into going down the extreme far end of 'Rabbit Run' at Kirkwood. Rarely have I seen my ski tips that far over my head. So he rented some gear the night before and we drove his truck from San Jose to Bodega Bay. It is a beautiful trip through the dairy lands of Cotati and Sebastopol. We drove to the outside of the bay, past the UC Marine Lab there which includes where Alfred Hitchcock’s 'Birds' was filmed. We got to the parking lot at Windmill Cove and it looked nice. It was early enough that there was almost no wind, small enough waves and beautiful blue water. The seagulls were everywhere... but none attacked. 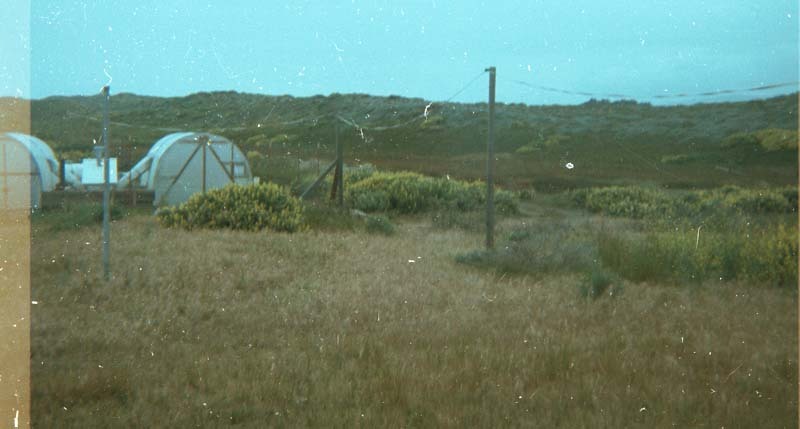 Looking towards the dunes of the biological reserve from the dorms. My private hiking area. 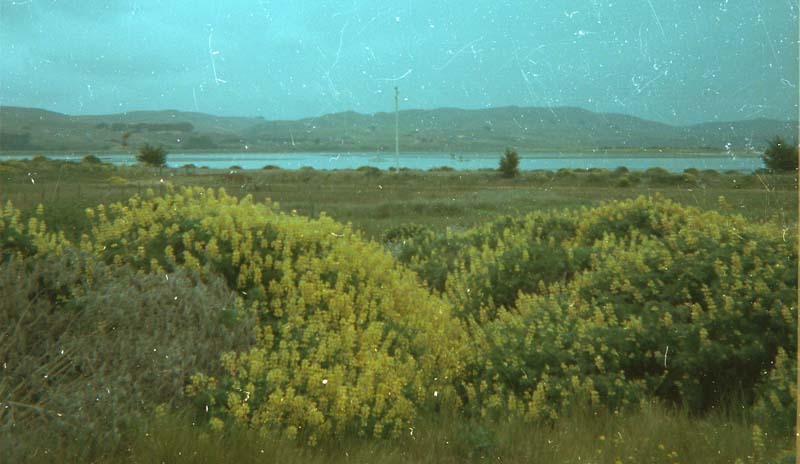 Looking towards Bodega Bay from the dorms. Oh, did I mention that Ron had never been diving before? Well, it is only snorkeling, though I have to admit, it is probably not the most ideal place to learn. It's better than where I took Mel to try scuba though. We suited up and I explained a few things about the dive spot to him, including that the current was why we enter through the rocks at the south side of the cove rather than the main open part of the cove. There is something of a perhaps 20 foot corridor on the side of the cove separated from the main open part of the cove by a line of rocks. 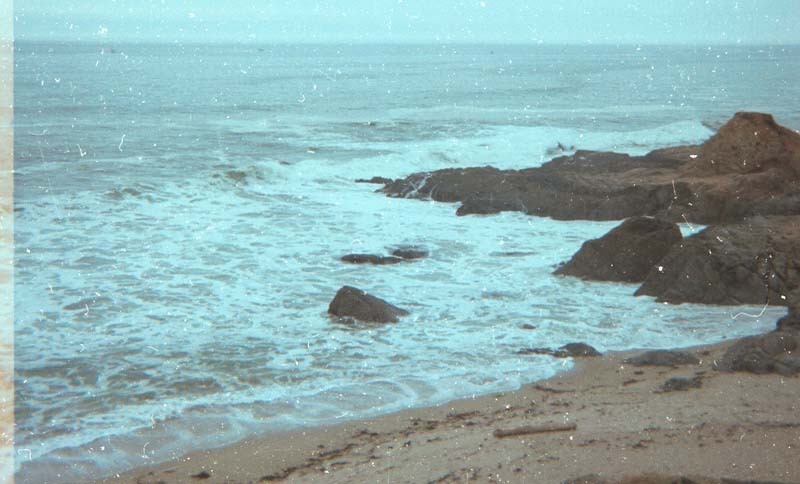 It is shallow rocks and has waves in it where the main cove really doesn't until the steep beach break. Actually though the waves were no more than 2 foot, I did notice that something was odd about them. The corridor is to the right of the picture. This is the point on the north side of the cove. It is great diving on the outside of it. You can see that the cliffs are small, but they are decomposed granite and must be climbed very carefully. The granite lends to decent vis. We entered through the corridor with me behind, urging him on. These waves were banging much harder than I expected. Once in them, I could see what I should have noticed from shore. They were not tipping. They were throwing. These were small, but they were actually powerful storm waves. Oh well. Instead of a perfect day, we were going to have to work for it some. It was still far better than many days I had gone diving here. We got past the fourth rock that made the corridor out. The water is about 12 feet deep there. Most of the diving, even for me, would be less than 18 feet, but it is beautiful lush diving with lots of life. Vis was about 12 feet, which is good there for early summer. There was lots of kelp of different types, fish and invertebrates of all kinds. There are also a lot of 8 1/2 inch abs. The surge was strong, but not a problem. I was coaching Ron and he had no problem getting abs. I was just sight seeing and staying real close just for safety. It is pretty wide open to the south and I didn't want any surprises from currents. There are no good exits and I felt like it was picking up a bit. I also noticed that Ron was moving his shoulders and stretching his arms an awful lot. I was keeping the bag on my belt with his abs so that it would be one less problem for him to deal with. 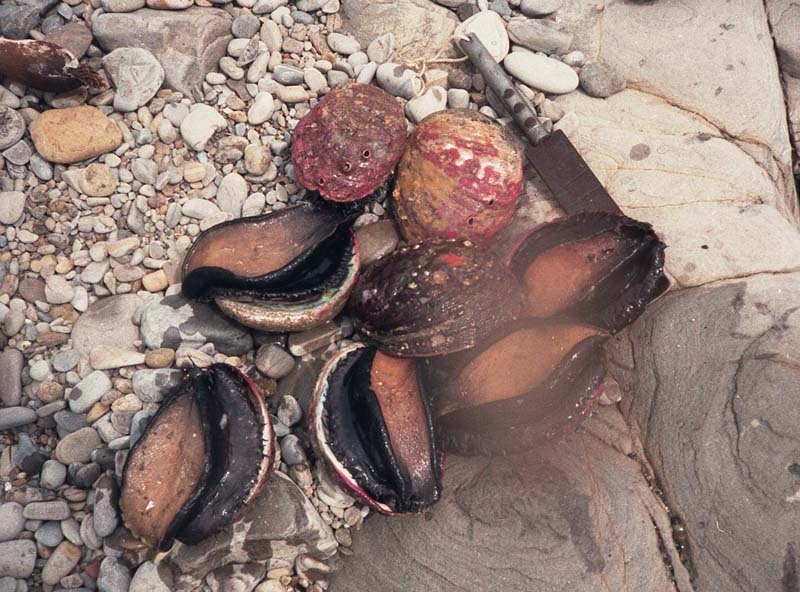 We had no float and I know from experience that 8 large abalone is about the limit I can manage to carry on my belt. He came up with his fourth abalone and I had to think about it. His eyes gave it away. I did not ask if he was OK. I asked if he was in trouble. He said 'YES'. I figured that his rented wetsuit was too tight across the chest. He was out of air and the exercise now had him almost completely unable to breathe. I thought about it for a second, cuz the water is pretty cool, then I told him to unzip his wetsuit. He gasped in air like an person who was shocked he could breathe again. It didn't seem like the cold water bothered him a bit at that point. 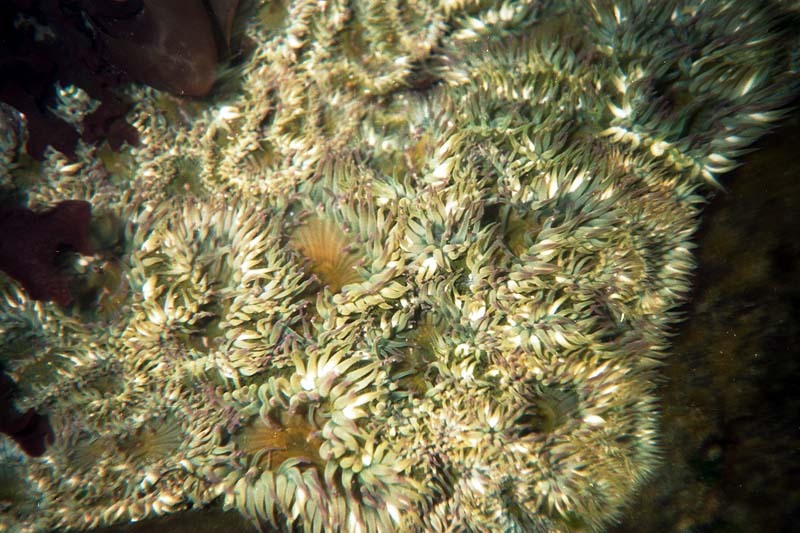 There are lots of Aggregating Anemones in the shallows. I asked if he was OK to swim in alone and I would fill out my limit. He said he was OK for that and turned around to head in. Only he headed in on the outside of the corridor. It looks like the right idea, but that current that goes into the cove, suddenly changes direction near shore and heads out the other side. It is a serious problem. I'm big and strong, but what I was able to do next surprised me. I grabbed him from behind and threw him all the way back into the corridor. Diver Ducks are like plywood on your feet. I bet it was a surprise for him too. He headed out through the corridor and I figured he would be OK, though I did watch until he was past the waves. Now I headed back into the cove for some relaxed solo diving like I enjoyed the most. It had gotten rougher, but I mostly dive down and find my way into cracks and other spots protected from surge. It is amazingly beautiful with lots of small fish and other life to see. There were red, green and brown algae of every variety as well as some iridescent Porfira. 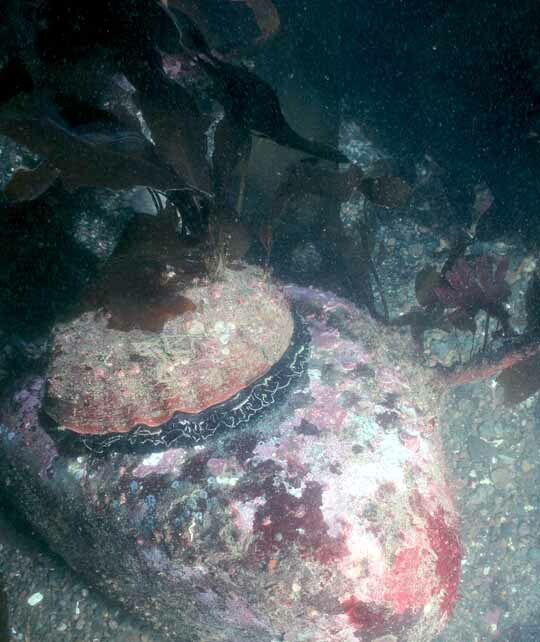 Rhodocladia and Rhodophera coralline red algae covered all the surfaces to exposed for larger kelps. There were sea palms where rocks stuck up near the surface. I love seeing Sea Palms. I wish I had scanned the picture better. I had no trouble getting more abs right away. I needed one more to fill our limit and that was OK, because with the heavy bag, the conditions were less than perfect. I was plenty ready to get out. A couple of sets had come and gone, but I just couldn't find another nice ab to make 8. I kept looking and looking, but amazingly didn't find one. Finally another set came in as I was passing in front of the one rock in the middle of the cove that sticks up the most. Normally, the water would have just washed me past or over it just like some more water. Instead, with that big bag of abalone hanging off my weight belt like an anchor, it slammed me into the rock. Heck with that! I'm tired, it's picking up and I have 7 nice abs in the bag. Time to go to shore. Only I was in the cove and I would have to work my way south out around some rocks to get back into the corridor. Well, I knew how to go straight in. Get as far south in the current entering the cove as you can and when the current turns near shore, sprint. You can get out of it and be only 50 feet from shore. Good plan. Now to do it. I went in swimming hard to get on the edge of the current that would be its front. I made it and had to try not to get sucked out, only now waves are breaking on me. I was swimming as hard as I could. I did something I almost never consider doing. I took the abalone off my belt and held them in my hand. I knew it was going to be close. I was at the limit of breath and over heating. If I had to, I would drop them. Going back out into the cove was not a good option. I made it to shore. Ron was there feeling fine. I was OK after some air. We picked up and relaxed. It's fun to walk around the cove and see the flotsam the sea has offered to the land. 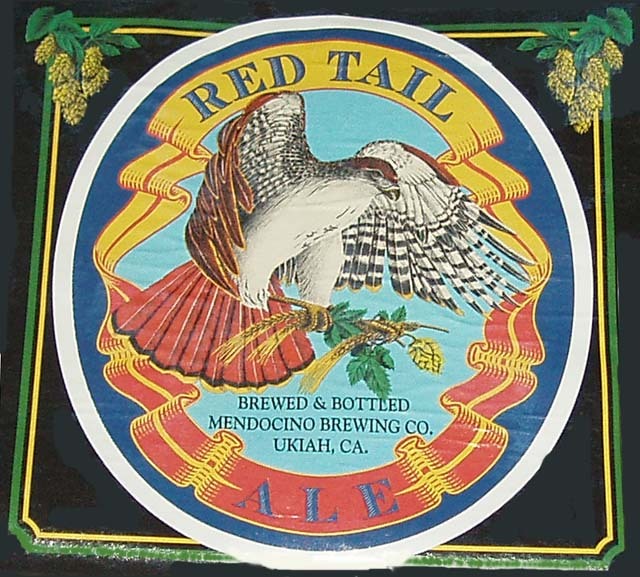 We cracked some beers to go with crackers and cheese as we changed into dry clothes. You might find it odd that I did a solo dive in a situation that took me to extreme, but really, I did that every other weekend. That is what the North Coast and the San Mateo Coast offer you a lot of the time. If it is OK with you to go in, that is just what happens and back then I was an incredibly strong swimmer used to conditions that are lethal if you make a mistake. I looked for the rough spots that other divers rarely visited. Up the coast of Bodega Head. The lab is in the cove in front of the last headland you see. I put some kelp in the ice chest to keep the abalone fresh and poured them from the bag into the ice chest. There were 8 of them. There had been all along. Tasty Wigglers. Notice the High School Metal Shop Abalone Sword there with 6, 7 and 10 inch marks.